What’s In Your Water Right Now? How Can You Recognize Reputable Certification? Which Water Filtration Criteria Matter To You? All whole house water filtration systems fall into a few simple categories. And once you discover the differences between these categories, you can quickly figure out what you need in your home. In some cases, you won’t even need a whole house system – just a specific filter for a particular task. If you want the best home water filter — something that can filter out any harmful contaminants and make your water taste great — then reverse osmosis systems are the way to go. Another benefit of reverse osmosis systems is that they are fully automated and on-demand — you don’t need to do anything to have clean, great-tasting water available at any time. Are there downsides? Well, while reverse osmosis systems are reasonably priced, they can cost more than some alternatives. Also, depending on which type you get (more on this below), they might require a professional for installation and maintenance. And, by the nature of their technology, reverse osmosis systems tend to waste a significant portion of water. These systems are not installed in your kitchen — instead, they are installed on your main water line (usually in the garage or basement), and they filter all the water that comes into your house. This includes the water that will be used in your kitchen, in your showers, in your washing machine, and yes — even in your toilet tanks. If you are using well water or have reason to believe your water is particularly contaminated, a point-of-entry reverse osmosis system might make sense. Most homes have some sort of water filtration system built right into them nowadays. Not all homes are so lucky. There are options on the market to help with this situation. Some of these filtration systems need more maintenance than others, and some of them can be installed and maintained without having to hire a professional to take care of the task. Either way, the goal is to make you feel safe about the water that comes into your home. 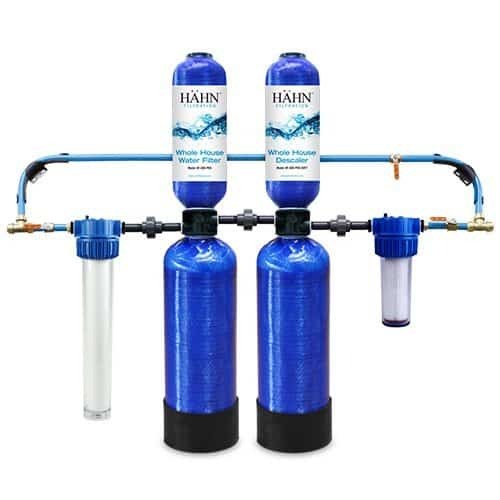 Like most companies that produce water filtration systems for homes, Hahn has made sure to provide a great product, but they have not imparted much information about it to their customers. The Hahn Whole Home Water Filtration System could be the right product for your home, though. Not much is known about the technology that goes into Hahn’s water filtration system. This model is a standard, 20-inch mechanical filter that removes particles from water larger than 20 microns. Some of the things this filter will remove from your water include silt and sediment as it runs on a Granular Activated Carbon System. However, you need to be made aware of the some red flags this raises for some people. Since Hahn’s product focuses on removing chlorine from water, it might pose a problem in your house’s pipes because bacteria, yeast, mold, and viruses would be free to grow without the presence of chlorine. All of these factors can put your family at risk for contracting diseases, so using this filter should be done with caution. Research suggests chlorine should be present in your water right up until right before it is consumed, which will limit the risk of illness from drinking the water or eating foods that have been cooked in it. One part of this home filtration system works as a water softener. This feature is great if your home makes use of well water as it will remove calcium and magnesium deposits. However, another part of this filtration system is a descaler, which should not be confused with a water softener by any means. This part of the system uses catalytic media in order to attract calcium ions. This process makes your water crystalline, which makes it easier and safer to consume. It is unclear if this product is a descaler, a water softener, or both. This situation can pose a problem for Hahn’s image as it might be a situation of false advertisement. Therefore, this filtration system needs some further definitions to be made about it on the company’s website and product packaging before a decision can be made as to what it really does. The last part of this tank runs water through a 10-inch filter. Hahn claims this part of the home filtration system will remove particles that are up to 60 times smaller than what can be seen by the naked eye alone. It is important to note, for the sake of reference, that the naked eye is able to see particles that are about 60 microns in size. This filtration system can be easily installed with a few tools. A wrench is the most needed tool for this task in order to undo the connections on the water system in your home. The wrench will be used to attach the new filtration system to your home’s water system. If you do not know much information or do not possess much skill or ability in plumbing, then you should look to hire a professional to do this task. This system works to process up to 7 gallons of water per minute with the best clarity. However, this situation could pose a problem for your home if you have a larger family. Homes of this size generally require a water filtration system to process between 15 and 20 gallons of water per minute. Well, larger families end up using more water at one, given time. It is not difficult to imagine that showers, dishwashers, clothes washers, and other units in the house might run at the same time when there are many people running around. Therefore, Hahn’s home water filtration system might not be the best idea for your home if you do indeed have a larger family. One of the larger concerns with this product is how generic it is. Like any store brand of any given item, this model is practically interchangeable with parts similar to it. It is really a bare bones model as it is not meant to perform much in the way of processing volumes of water at one time. It might only be sold at a few locations, but this scarcity should not fool consumers. This filtration system does remove chlorine form the water before it goes into the home, as stated previously. This situation might place the home at risk for bacteria and other illness-causing invasions, but it does add some healthy options to the home. For example, you can breathe more easily with chlorine being removed from the system because it means steam from cooking and bathing will not release particles into the air that could make someone will breathing difficulties become ill.
Removes synthetic chemicals from water, making it healthier to cook with and to drink. Removing these chemicals also makes water softer and easier on skin as it will not cause excessive irritation. Removes heavy metals like lead and mercury from water sources. Organic chemicals like herbicides and pesticides are also removed from water sources. Long lasting filtration system that does not need to be serviced any more than once a year. Can be serviced as a DIY project with ease. Filtration parts are easy to clean and replace. pipes within the home, making them a breeding ground for illness. Little information is provided by the company about the Hahn Whole Home Water Filtration System. These are the most common type of reverse osmosis systems. As their name says, they are typically installed under the kitchen sink, where they provide purified water that can be used for drinking and cooking. The filtered water comes through a special faucet which will be installed next to your regular faucet. This way, you can use filtered water only when you need it (for example, there’s normally no need to wash dishes with filtered water). This can be just as effective as a whole house filtration system because hard water or chlorinated water will most likely affect you the greatest in the kitchen. Usually, you won’t need such a system in your bathroom, for example. A typical under-the-sink reverse osmosis system has between three and six filtering stages, and filters out over 99% of pollutants such as bacteria, cysts, fluoride, and chlorine, while also removing the vast majority of dozens of other common contaminants from your drinking water. Installing an under-the-sink reverse osmosis system is relatively simple, though most installations will require some common tools such as wrenches, a screwdriver, and a drill. Replacing the various filters is even simpler and does not require any special tools. 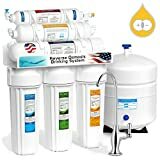 If you are looking for the best and most convenient water-filtration system, then this is the type I recommend. The only caveats are that you have the space under the sink to install them, and you have to make minor modifications to your counter (drilling a hole for the extra faucet), which might be an issue if you are renting your home. Which under-the-sink reverse osmosis system should you choose? There are literally hundreds of models out there, and I’ve spent a lot of time researching and reviewing many of them on my site. Here are three of my top recommendations. 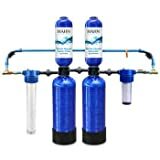 This is a excellent six-stage reverse-osmosis system that does a great job filtering contaminants and producing wonderful tasting water. However, I’m recommending it because of a few special features that make it stand out. First, this model features a permeate pump. Basically, this is a mechanism to increase your water pressure. As I mentioned before, the greater the water pressure, the more effective your reverse-osmosis system, and the less water you’ll waste. As a result of the permeate pump, this model only wastes 1 gallon of water for each gallon filtered (compared to 4 gallons wasted on many other models) and produces better water pressure out of the faucet. A second unique point is that the TMHP has a modular system that makes it particularly easy to install, even if you don’t consider yourself very hand with DIY projects. 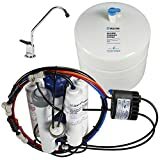 The RODI10D is a highly-rated six-stage reverse osmosis system that does a great job filtering contaminants, and also incorporates a water-softening stage (I’ll talk more on water softeners later on in this guide). This basically means you will get rid of much of the calcium and magnesium in you water — making your water taste better and keeping these minerals from collecting on your dishware. This is a sleek and modern four-stage model, which makes for particularly easy DIY installation (even more so than the other models on this list). It features a newly developed, patented technology to cut down on water wastage and delivers a water rate that’s twice as fast as other non-electric systems. This system also uses automated filter flushing, which significantly extends the life of its filters. As the name says, this variety of reverse osmosis system sits on your kitchen counter. It does not need to be installed and is a perfect choice in case you cannot make changes to your kitchen (for example, if you rent) or if you simply don’t have the space for an under-the-sink system. These systems simply connect to your standard faucet and work in minutes. They can also be easily moved between different faucets if that’s what you need. Here are two outstanding countertop reverse osmosis systems. This model looks much like a typical under-the-sink reverse osmosis system, except there’s no tank and there’s no installation involved. The benefits are clear: purified water that tastes great and that’s free of contaminants, bacteria, and chemicals — without requiring any installation. One notable downside of traditional countertop reverse osmosis systems is that they don’t look very nice, with tubes and filter units sprawling around your sink. Well, a few companies have taken care of this problem by packaging up the entire countertop unit into a stylish unit that will look great in your kitchen. The ZIP is one of the nicest of these modern systems. 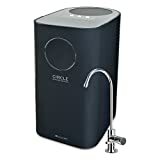 It provides typical high-quality reverse osmosis filtering for your water, but it doesn’t even need to be connected to your faucet. Simply fill up the bottom container and within 10-15 minutes, the top container will be filled with a half gallon of purified water. The makers claim a 50% space savings over traditional reverse-osmosis packages, while providing a complete 4-stage reverse osmosis system. You’re probably familiar with water pitchers — they’ve been hanging around many kitchen countertops for decades. Pitchers generally use an activated carbon filter and good old gravity to pull the water through the filter. This is effective in removing certain minerals and metals like lead, zinc, and mercury from your drinking water. 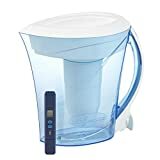 While this can be important for health and can improve water taste significantly, it’s also important to realize what water pitchers do not filter out. 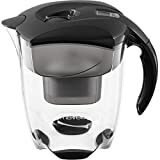 Most water pitchers do not filter out fluoride, and almost all water pitchers will not filter out bacteria, cysts or other biological contaminants you might find in tap water. You’ll need to check the descriptions of individual filters to see whether they are actually effective against the contaminants that you want to protect yourself from. With that said, here are three water pitchers that I recommend. 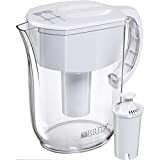 Brita is the biggest name in water pitchers, and the Everyday is Brita’s best-selling model. It filters copper, mercury, and cadmium while reducing chlorine taste and odor. This is an effective, basic pitcher for an overall better drinking experience. The MAVEA Elemaris XL filters the same metals as the Brita Everyday in a more stylish design. However, it also offers several improvements. For example, the MAVEA filter is treated with silver to inhibit bacterial growth and requires no pre-soaking. This pitcher also features a microfilter to reduce black carbon bits coming out in the filtered water (a common complaint with pitchers). Finally, the MAVEA company offers a filter recycling program to reduce waste and minimize the environmental impact of its products. This model has been tested and recommended by several independent sources, including Consumer Reports and Natural News labs. The reason why is clear — this pitcher filters water better than the competition, particularly when it comes to metals such as lead, aluminum, and cadmium. While the ZeroWater provides very good filtering, there is a downside. Its filters need to be changed frequently — many users say every few weeks or so — in order for it to keep giving you fresh, great-tasting water. Have you ever noticed a buildup of scum in your bathtub, or a calcified layer on top of your faucets? This is caused by hard water — basically water that has a lot of dissolved minerals such as magnesium and calcium. Now, hard water is not a health issue per se, but it can nonetheless be a problem for many other reasons. Besides the ugly buildup on your sinks, your faucets, and your tiles, hard water will gradually reduce water pressure in your home. This is annoying, and it can also reduce the effectiveness of your reverse osmosis system if you choose to get one. Hard water will also leave spots on dishes once the water dries, and it will reduce soap lather — making it more difficult to get yourself and your clothes clean. Hard water will shorten the lifespan of your appliances, your pipes, and it can even make your water heater less effective. If you’re not 100% certain that you have hard water in your home based on these symptoms, you can get a water hardness testing kit at a home improvement store for around $10 and test it out yourself (it’s just a set of little strips you have to dip into a cup of tap water). That said, what are your options when it comes to softening your water? That’s simple. You can get a water softener. This is a device that typically gets attached at your main water line and filters all of your incoming water to make it softer. Let’s look at the two main types. Most water softeners work on the principle of ion exchange. Basically, the water softener uses a bit of chemistry magic to swap out the magnesium and calcium ions in your water with sodium ions. This process is called salt-based water softening (because of the sodium) and it actually removes magnesium and calcium from your water (they get flushed down the drain). Because these types of softeners need to prepare the sodium that will be swapped in place of the magnesium and calcium, there are a couple of consequences. The first is that you will have to regularly refill your water softener with salt. The second is that there will be times (so-called “regeneration periods”) when your water softener isn’t available to produce soft water. If this sounds like a hassle, then there is a second type of water softener called “salt-free” or “saltless” because no sodium is involved. In this method, the magnesium and calcium stay in your water, but they are transformed in a way that makes them less likely to stick to things. Which type is right for you? Well, it depends on how hard your water is and what you are looking to do. Salt-based water softeners will free you from all of the negative effects of hard water I listed above. On the other hand, they require more maintenance than salt-free water softeners, and they waste water while the salt-free systems don’t. As for salt-free systems — these are simple and easy to maintain, they don’t require electricity, and they don’t waste water. On the other hand, since they don’t actually remove magnesium and calcium from your water, these minerals will still accumulate over time and cause many of the same problems from above. In short, if you care more about having soft water, go with a salt-based system. If you want some of the benefits of a water softener but also care about convenience, you can be fine with a salt-free water softener. Either way, here are a few salt-based and salt-free water softeners that I can recommend wholeheartedly. If you’re looking for a no-holds-barred water softener that will do a fantastic job while giving you a lot of use and flexibility, then this model is it. It’s a proper water softener (salt-based), and it can effectively soften a large volume of very hard water, up to 12 gallons a minute. In addition, it comes with an LCD screen to control the system as well as with programmable cycles that allow the system to regenerate specifically when you don’t need soft water. In short, if the most important thing to you is doing a good job softening your water, this is the model you need. The WaterBoss 220 is a wonderful salt-based water softener. However, the thing that sets it apart is its compact size — it will fit into locations that might be too small for a typical water softener. In spite of this, the WaterBoss 220 has great capacity. It’s good for a medium-sized family in a home with hard water, or a large family with medium-hard water. In addition to its compact size, this model is characterized by whisper quiet operation, a fast regeneration cycle, and easy installation. The Aquios is a salt-free water softener. Within this category, this model is a market leader. It removes chlorine and unwanted impurities from your water, while ensuring calcium and magnesium do not build up in your fixtures and pipes. With no pressure loss, sleek design, no need for programming, electricity or maintenance, this system is a serious competitor to salt-based water softeners. Reverse osmosis systems basically use household water pressure to push water through a series of filters and membranes that remove silt, sand, chlorine, bacteria and viruses, as well as a host of other chemical and biological pollutants. If you want a specific contaminant out of your water, there’s a reverse osmosis system that does it. What happens to all the filtered contaminants? Well, they go a separate route and are basically flushed down the drain, along with a portion of the incoming water that didn’t make it through the various small filters. On average, a household reverse osmosis system will waste between 1 and 4 gallons of water for each gallon of purified water produced. So is that all you have to know? Well, actually, there is a lot of variety among different reverse osmosis systems. First off, reverse osmosis systems differ in the kinds of filters and membranes they include. The more sophisticated and powerful the purification capabilities, the more you can expect to pay. Reverse osmosis systems also differ in whether they have a tank. Some systems store purified water in a tank so it can be available for immediate use. Once the tank is depleted, you will have to wait a bit to get an adequate flow of water. Other reverse osmosis systems are tankless — this is typically used in locations where there isn’t enough space for a tank. A third difference among reverse osmosis systems is the location where they are installed. This is perhaps the most visible difference when it comes to choosing a reverse osmosis system, so let’s look at the different options in more detail. A little while ago, I got to talking with my dentist, a very well-informed and health-conscious guy. He said he doesn’t use any kind of water filtration system in his home, because he’s not sure where to get started and he’s afraid of wasting money on the wrong kind of setup. Since I run a website that covers all aspects of water filtration, you can imagine this was a bit of shock to me… and made me think. Because I write about this stuff all the time, I just assumed that everybody understands these simple differences as well as I do. That’s been my mistake. And it’s a big mistake. Because if people don’t understand which kinds of water filtration systems are available to them, they are likely to avoid filtering their water altogether. “So what?” you ask. Well, here’s “what”. If people don’t filter their water, they are getting exposed to all sorts of pollutants, toxins, and pathogens. Sure, the Environmental Protection Agency (EPA) requires municipal water to meet certain basic standards. The trouble is these standards are very lenient, and many harmful substances are still present in municipal tap water. Over the past year, contaminants like lead, pesticide runoff, arsenic, nitrates, byproducts of water treatment, antibiotics, hormones, bacteria, and viruses have all been found in tap water sources across the U.S.
Exposing yourself to these kinds of substances and consuming them in drinking water, day in and day out, is a recipe for serious health problems, from infections and poisoning, to liver and kidney damage, to even cancer. And if you are pregnant, have young children, or suffer from a chronic illness or a compromised immune system — then these harmful substances are even more of a concern. What’s more, health isn’t the only reason why using a water filter system in your home makes sense. Filtered water looks, tastes, and smells better, because it’s had impurities removed. Also, using filtration to treat “hard” water can extend the lifespan of appliances such as your washing machine and dishwasher. It can also lead to cleaner and neater bathrooms and kitchens, and it can even make for more pleasant bathing. Finally, if you ever drink bottled or delivered water, then filtering your own water can save you lots of money, while at the same time guaranteeing water purity and quality. For all these reasons, it’s important people should get adequate information about water filtration for their home. Well, a good place to start would simply be to discuss the differences between the main types of water treatment options, so you can decide which one is right for you. I’ll do this in a second, but first, let’s first address the question of what exactly is in your water, so you can decide what you need to remove. Different utilities provide very different qualities of water, and this can vary wildly across states or even metropolitan areas. You need to get an idea of what is in your water so you can decide later which kinds of filters you need. This isn’t a perfect science, but it can help you ensure you are protecting yourself against contaminants you are more likely to be exposed to. It also means you can avoid wasting money on certain filters that you might not need. The way to get this information is to get a “consumer quality report” (CCR). This is a document that each water utility should already be providing you once a year. If you never received yours or you simply mislaid it somewhere, you can call or write your water utility and ask them to provide you with a new copy. The CCR will list the contaminants found in your utility’s water, hopefully based on testing done within the last year. You probably won’t find any violations of EPA-mandated limits, but you can still find that some contaminants are at high levels, even if those are less than what the EPA allows. How can you know what all of the contaminants are and whether you should worry about their levels? A good resource for this is the EWG drinking water database. EWG is a consumer protection watchdog group that has more strict criteria for water safety than the EPA. Their database gives a clear explanation of what each contaminant really is, what the associated risks are, and what levels are likely to be harmful. The same EWG database also has historical records (from 2004 to 2008) of many utilities across the U.S. You can use this to see whether your water provider has a history of contamination with specific substances, even if they are not present in the most recent CCR. The main certification when it comes to water filtration is through a non-profit organization called the National Sanitation Foundation (NSF). 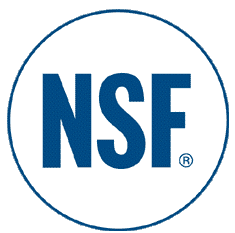 NSF is made up of experts in public health and manufacturing, and it provides a reputable and reliable way for products (such as water filtration systems) to prove their quality. At bottom, companies can voluntarily apply for NSF certification to show that their water filtration system takes out undesirable things out of your water, and doesn’t put anything harmful into the water. More specifically, there are two NSF standards for water filters: Standard 42 (Aesthetic) and Standard 53 (Health). When a water filter meets the aesthetic standard, it significantly improves water taste and odor. On the other hand, when a water filter meets the health standard, it reduces specific contaminants (the certification will list which specific contaminants it reduces). 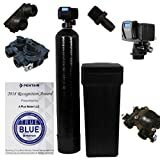 You can typically find the NSF certification on the packaging of your water filter, or if you are buying a water filtration system online, you can search the NSF site directly to find out which certification a specific product has. A few other organizations provide reputable certification of water filtration systems. These include the California State Water Resources Board, the Water Quality Association, and IAPMO R&T. While valid, these programs are less well-known and therefore fewer companies bother with obtaining their certification. They might be worth a look if you are interested in a product but find it’s not NSF-certified. 1. Contaminants that are filtered. Depending on the current quality of your water and on your health concerns, you might want to filter certain pollutants while others might not be an issue. 2. Taste. If taste is important to you, you’ll need to get a water filtration system that filters out not only contaminants, but chemicals used for water treatment such as chlorine. 3. Cost. This can be in a big range from $30 to $500 and up, depending on what you are getting. The good news is there are no luxury water-purification systems that charge you a premium just for their name. In other words, differences in price reflect genuine differences in technologies and purification abilities. 4. Throughput. How much water do you need at a given time? Some systems can give you a few quarts at a time, and then take some time to fill up again. Other approaches are on-demand, and can give you as much water as you need. 5. Water wastage. Some water filtration technologies waste a significant fraction of the water that passes through them. If you live in an area where water shortages are a common concern, this is something you may need to consider. 6. Installation. Some systems require no installation. Some you can do yourself, while others will probably require professional help, unless you are a do-it-yourself commando. 7. Maintenance. All water filtration systems require some kind of maintenance to replace filters. However, some systems are easy to maintain yourself, while others require more skill or might even call for a professional. These three water filtration systems — reverse osmosis, water pitchers, and water softeners — should cover your water-treatment needs whether you’re looking for top-notch water quality or simply an improvement in taste and appearance. The next step is to figure out exactly which approach and which model is right for you and your home. Follow the steps in this guide, starting with finding out what’s currently in your drinking water, and considering which criteria matter most to you. If you’ve got the space for it, I strongly recommend getting a reverse osmosis system, and I believe that it’s an investment that will soon pay for itself, both in terms of your health and in terms of maintenance bills. If reverse osmosis isn’t an option for whatever reason, then consider a high-quality water pitcher which filters out specific heavy metals that might be present in your tap water. I hope you’ve found the information in this guide useful, and I hope it will help you decide on a water-filtration approach that’s right for you and your family.